That means that they mustn't look alike. Nor be groomed the same way....if they are? There's a problem. This is France and we're talking Barbet, not any other international refabricated breed and certainly not a ........French Poodle looking dog. This photo dates back again to the Poppenspalers' days when a water dog looked like a water dog according to the country it came from. Nowadays, many (more and more)breedres are claiming Poppenspaler's descendance whereas the dogs look like? hard to tell, especially when the grooming makes them all lookalike. 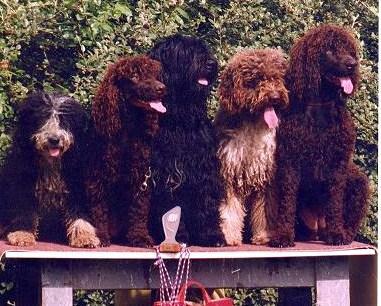 A Barbet français mustn't look like any of them. If it does...then Houston..there's a problem. Good thing Georgy doesn't have internet. And Mrs Pêtre either.